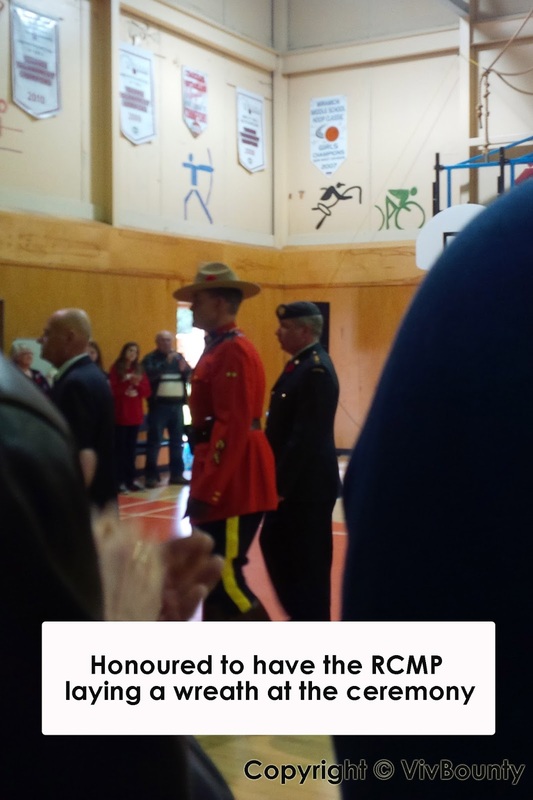 Hello There, VivBounty here to share with you our experience of the Remembrance Day Ceremony to thank the men and women who bravely served in our little school. 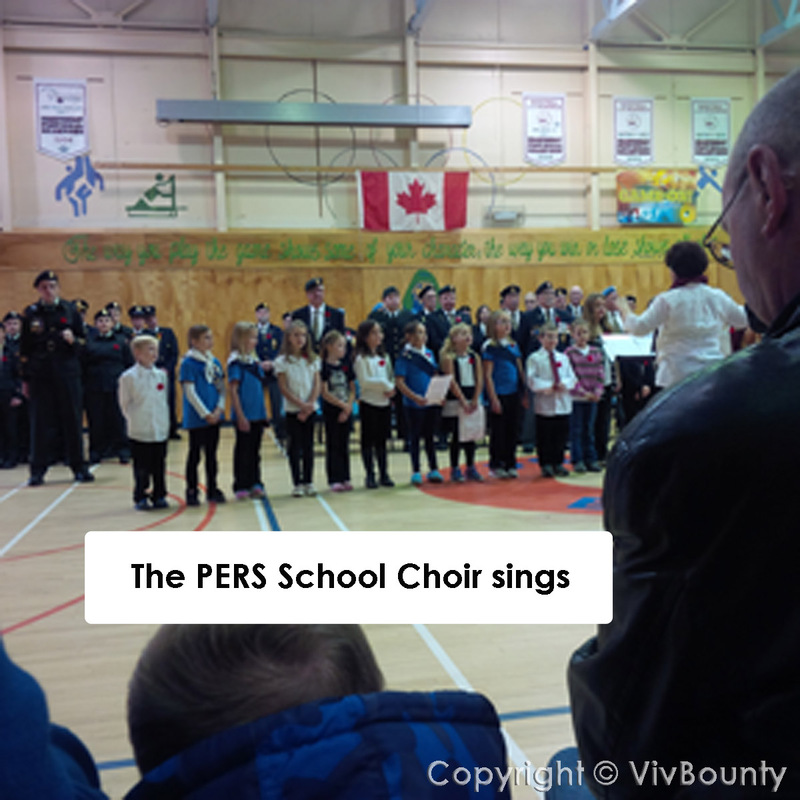 We gathered in the gym and the ceremony began with the school choir singing. 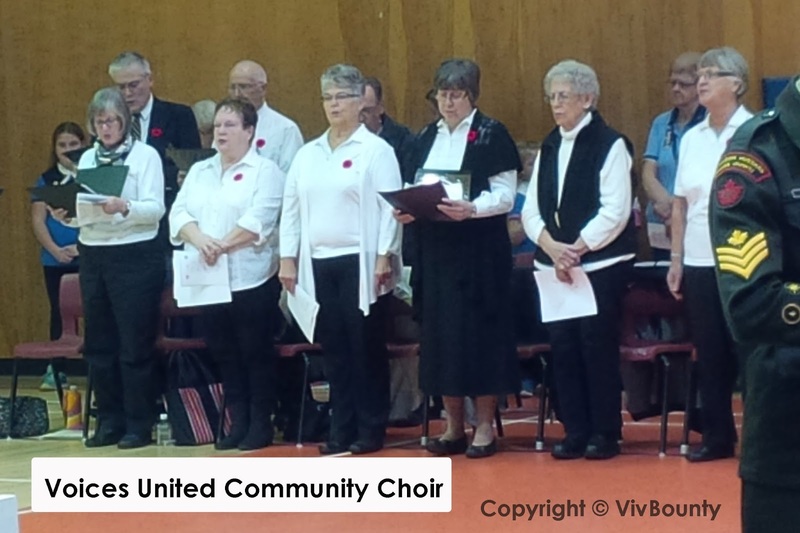 After the march on the flag, the Voices United Community Choir led us in singing our national anthem, "O Canada", and other songs and hymns so beautifully sung by both choirs were O God Our Help in Ages Past, We Remember, God Save the Queen and Go Now In Peace. The parade forms up and vigil is mounted followed by march on the flag. 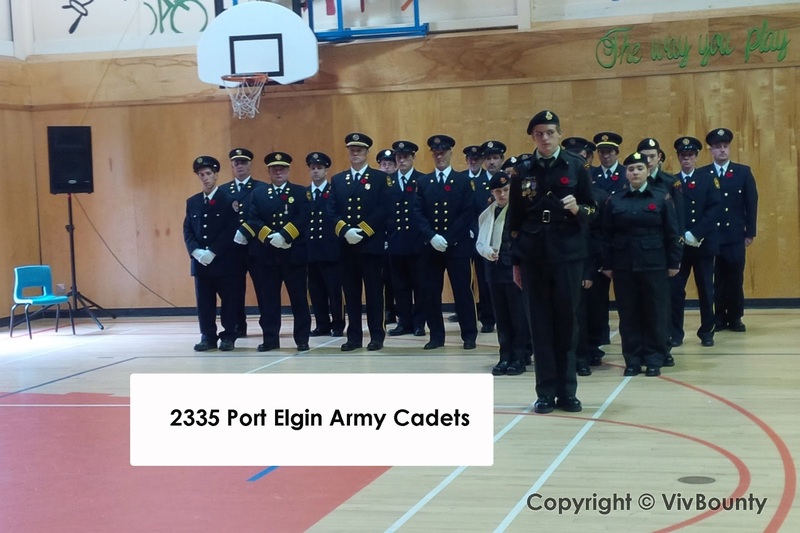 Our cadets did a super job. 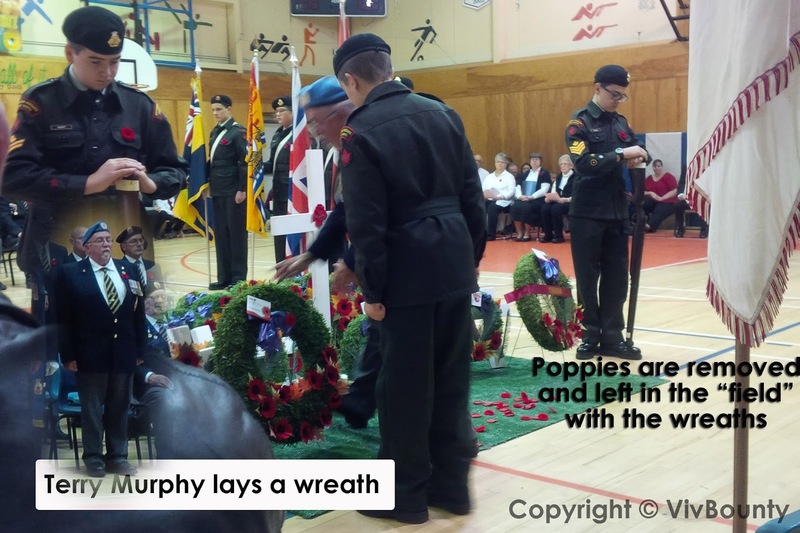 Missing in photos because of where I was sitting is the MC, Courtney Wall who read the Gospel, announced the dedication of the wreaths, and kept the program organized, Joe Simpson who read the honour roll of the veterans, There were poems by Marissa LeFurgey and Jesse MacQuarrie and Invocation Prayer by Reverend Bill Drysdale. 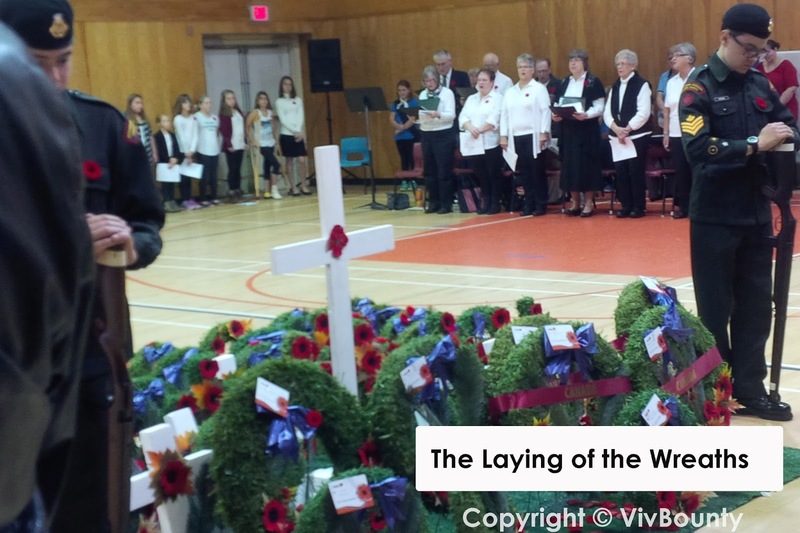 Of course, the poem, In Flanders Field was read by a cadet, officers saluted during O Canada & God Save The Queen sung by the School Choir and Voices United Community Choir, Last Post & Reveille bugled by Jim MacTavish, and 2 minutes silence. 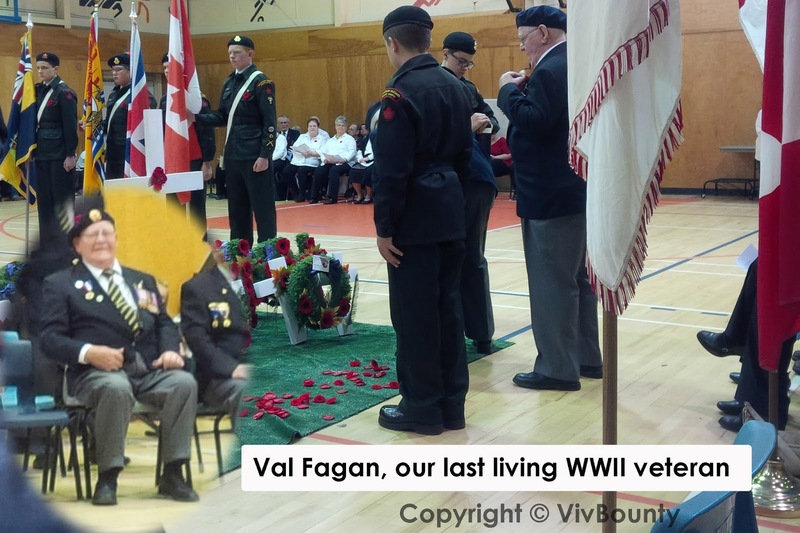 Amidst the laying of the wreaths, of which there were so many, some had to be laid ahead of time, we had our last surviving World War II veteran, Valerie Fagan, Korean War veteran, Lionel Halfkenny, our Mayor, Judy Scott, the RCMP and Terry Murphy who was attached to the Fort Gary Horse in Cyprus, 1966 67. It was very touching to have begun the ceremony with a moment of silence for the two young men Colby Callender and Chad Alder who died tragically in a car accident last week. 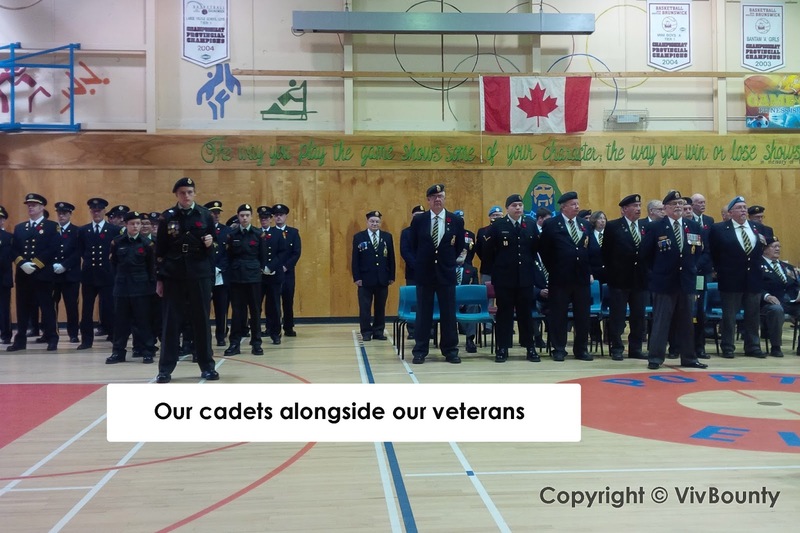 We also had fewer cadets this year as many were too grieved to perform today after losing their friends. 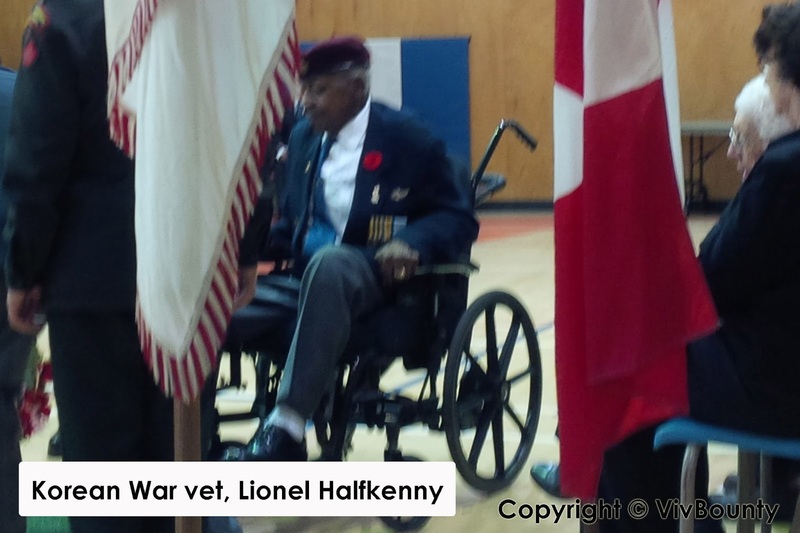 The gym was full for the Remembrance Day Ceremony and there was a palpable sadness in this tiny close-knit community. 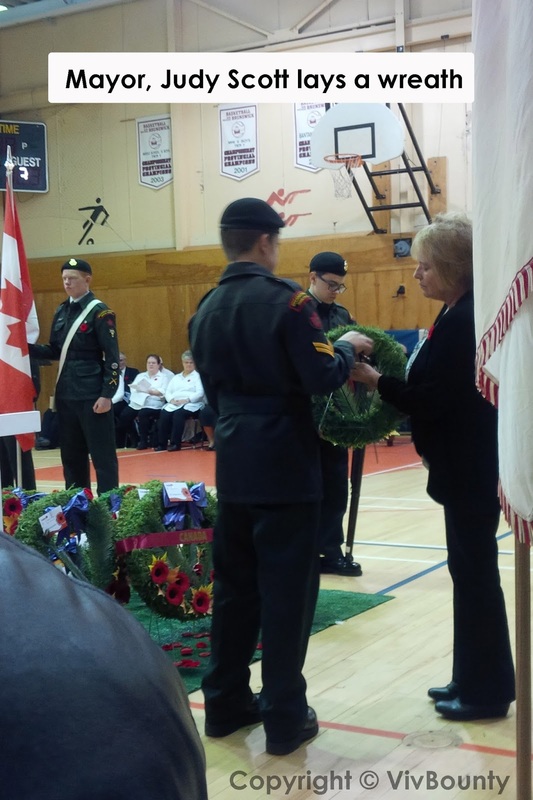 The cadets who did participate represented the whole valiantly. There were time constraints because the funerals to be held at 2 p.m. and 4 p.m. this afternoon were being broadcasted by livestream to the school in anticipation of the large attendance. World War II in the R.A.F., this day was even sadder as it brought back the sadness of losing my own godchild, much too soon, 4 years ago. I remember the shock, I remember the many, many people who came who knew us as far back as our grandparents and their friends and all the young people. We too needed more pews, more space at the funeral home and a very, very long procession of cars to the cemetery. So in remembrance, we received Benediction and blessing from Reverend Carmen Webb, and then the gym had to be set up for the funerals. Thank you to all our veterans, the ones we knew and so many we never will who sacrificed for us, brave warriors who made our freedom possible. We are eternally grateful. Until next time, hug the ones you love, particularly your children, appreciate and encourage them today because tomorrow is not promised. Thank every veteran who ever served in any war as it is they who have paid for your freedom.